Improv frees you up to live a life less ordinary! Release creativity, be more confident and learn how to be present in the moment. Lose performance anxiety. 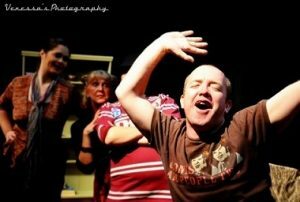 Classes are incredible fun and will strengthen your social and acting skills. Techniques learnt are invaluable for both acting and public speaking. Classes run all year at Grey Lynn Community Centre, Auckland. Come along and try a class for free! We can all become confined into our roles in life, whether it be at home or at work. Improvisation is a fun and creative way to learn how to express yourself more confidently. Live life as the most you can be and learn how to be more present in the moment! Build confidence in work or social situation and overcome presentation nerves and social anxiety! Improv. is an invaluable life skill that you can apply to your everyday life, in presentations at work and easier interactions in your daily life! This class is suitable for all levels of ability!